Social media banking. The Visible Banking team invited a banking customer and social media user to review the Bank of America facebook page. You will find below Graeme’s views on the Bank of America facebook page. Christophe Langlois and his Visible Banking team have invited me to take a look at the Bank of America Facebook page and offer my opinion of what they had to offer through it. I do some SEO work myself from a content perspective, but I am in no way a social media expert. What you will find is simply my honest observations about this social media banking effort from Bank of America and what value I find in it as a user of social media. What Bank of America does well is promote others as they promote themselves. Throughout their Facebook page, they have created a social media banking experience that builds brand awareness for local companies that do business with them. There is regular communication with people who leave comments on posts and people are tagged so they know that Bank of America has responded to their concern or comment. This helps customers that have chosen Bank of America a level of social customer care that is better than the average organization. Rather than provide a level of valuable content, Bank of America takes the approach of having others share what works for them on the Bank of America Facebook page. This allows someone with an issue to solicit several ideas in one location on how to solve that issue, rather than have to research dozens of blogs, articles, and other content. Because this is virtually the only way they use the Bank of America Facebook page, however, it does seem more like a mill to gather comments than it is a place to find valuable content. From a social customer care perspective, Bank of America has made it a simple prospect to find the information you may need or start the customer service process. A helpful tab tracks locations of ATMs and branch locations near your zip code, while a “Get Help” tab allows you to send a message directly to the customer care team directly from the Bank of America Facebook page. You can even schedule an appointment online regarding your issue if need be. This makes for a positive overall social media banking experience. The Bank of America Facebook page shows that they want to engage with their customers in a way that works for them. Showing how others have succeeded using Bank of America products and services can bring some hope for personal success, though it is basically a sales tool that is also used to gather comments and ideas that essentially benefit the organization more than the average user. 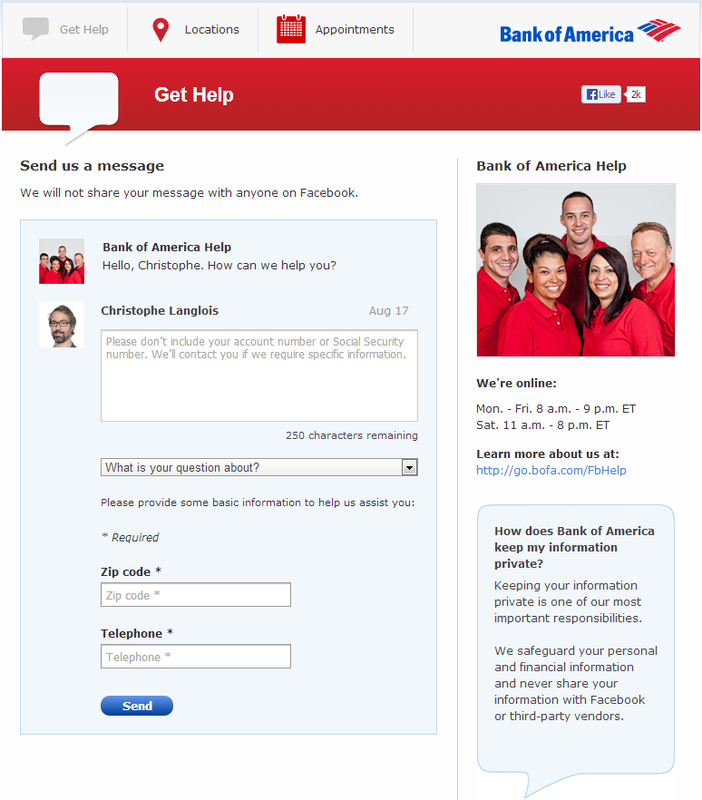 Bank of America does regularly engage with people on their page, providing a superior level of social customer care. Overall I would rate the Bank of America Facebook page a 6 out of 10. This is not a Facebook page that I would normally “like” simply because there is no value in it for me whatsoever. I don’t browse comments to gather ideas – I read articles, journals, scientific papers, etc. Bank of America doesn’t provide that. I wouldn’t actually recommend this page to my family and friends unless they were customers of Bank of America. 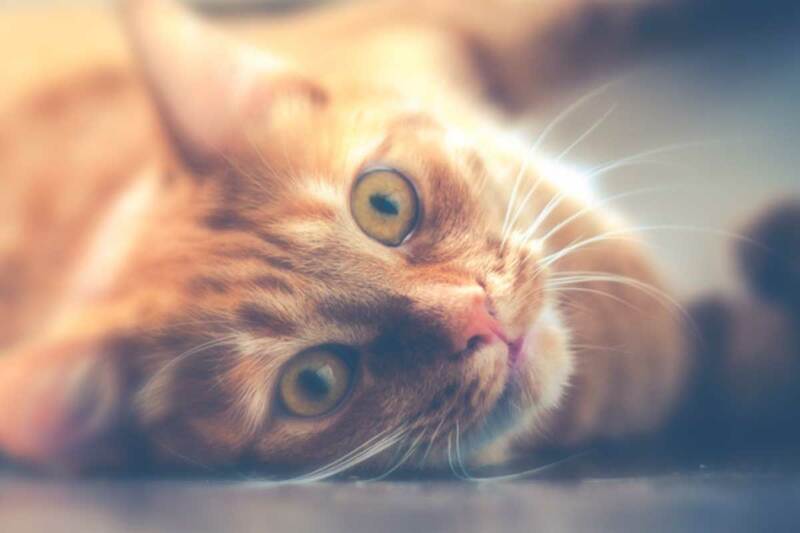 The best aspect of their page is the social customer care aspect, with a secondary benefit of being able to look up ATM and branch locations without having to access the primary site independently. Outside of that, it’s basically one big sales pitch for the bank. Would I do business with Bank of America? Possibly, if they were able to provide me with an advantage over my local banking institution. Considering the rates that I get and that Square can beat BoA in credit card processing fees, right now I would have to say no. I do like that they promote businesses on their primary page, but that’s also something I can find on my own easily enough without their help, so that’s of little personal value. If this page were my page, I would add variety to the posts. Link to articles about the future of banking, why to choose a bank, what kind of accounts to carry, etc. The engagement is pretty good, but there’s no real information value beyond what people comment on. In the last couple of years, Bank of America invested significant amounts of budget and resources on social media banking with a key focus on social customer care. They now provide one of the best levels of customer service on twitter and facebook in the worldwide banking industry. 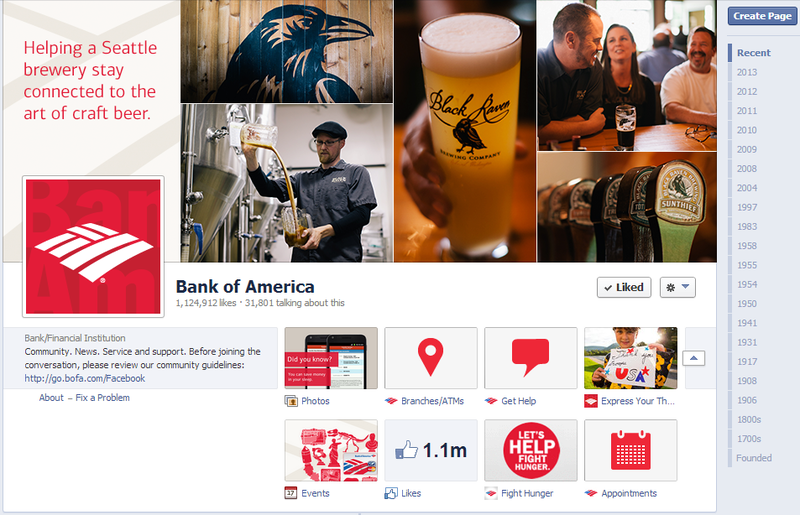 Have you visited the Bank of America facebook page recently? If yes, do you share Graeme’s views? We invite you to tell us what a bank should do to successfully engage with you on facebook. Join the conversation here or on twitter.